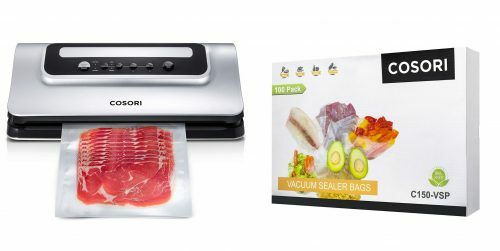 Our reviewers looked at 39 different Vacuum Sealers including 1 from Cosori. We reviewed each vacuum sealer for features offered, ease of use, quality, and price. We feel that the best Cosori BRAND Vacuum Sealer is the COSORI CP428-VS Review. You can compare this model to one of our top recommendations the NutriChef PKVS18SL which we feel is a much better value for your money. Use our Comparison Table below for more information and links to our full detail reviews. COSORI does not make it's own line of Vacuum Sealer Bags. Instead we recommended our top Vacuum Sealer Bag OutOfAir is a Universal Vacuum Sealer Bag is compatible with most vacuum sealers, including MonoPrice, is a higher quality and is available for a better price. You can see other compatible bags on our Generic Vacuum Sealer Bag Reviews page. Our reviews show the best Cosori Vacuum Sealer is the COSORI CP428-VS Review it offers the best combination of features, ease of use, and price. 16" x 4" x 8" 6" x 14" x 3" 15"x 7"x 3"
The COSORI CP428-VS is an average quality vacuum sealer that's best suited for occasional use only.